The Faculty Center for Teaching and Learning (FCTL) has at the heart of its mission the goal of helping ACC faculty guide other faculty. Join this ONLINE conversation to get the latest evidence-based teaching tips from experts AND hear how your colleagues think they can creatively use them in ACC classrooms. Computerside Chats are transcribed for accessibility. The link to access CART will be provided at each session so all our faculty can join in! Participants are entered for a chance to win a copy of the book! Subscribe to automated reminders about Spring 2019 sessions. Computerside Chats are the ACC book club for faculty where you DON’T HAVE TO READ THE BOOK! 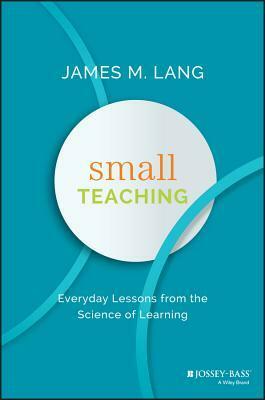 Chats focus on the book “Small Teaching” by James M. Lang. In each session, you’ll be introduced to material and then have time to engage in an online conversation with your teaching colleagues about how ACC instructors might adopt some of these new methods in their classrooms. You’ll be able to get the latest evidence-based teaching without having to dig into the research on your own. Click on the months / chapter titles below to see scheduling information and to register. There will be two sessions each month so you can select the time that works best for you. You must pre-register for these events to get the link that will allow you to participate online. Available for online order OR available to check out from the FCTL Library Collection. You can also go directly to the library print copy or ebook copy. This is part 1 of a 4-part online learning workshop for ACC faculty. Feel free to join us for as many sessions as you can, but recognize that this series is designed so that you don’t have to attend every session. Session one focuses on chapter 5, covering Practicing. When it comes to memory, practice makes PERMANENT! Help your students harness the power of practicing by incorporating practice opportunities in your class. Sign up for whichever time below works best for you. The same content will be covered on both of the February dates. Select one of the following times and register by clicking the link below. This is part 2 of a 4-part online learning workshop for ACC faculty. Feel free to join us for as many sessions as you can, but recognize that this series is designed so that you don’t have to attend every session. Session two focuses on chapter 6, covering Self-Explaining. Learners often struggle with handling new material because they don’t take ownership of the information. In this session, we’ll discuss how teaching students to explain things in their own words as they learn can improve understanding and memory for course content. Sign up for whichever time below works best for you. The same content will be covered on both of the March dates. Select one of the following times and register by clicking the link below. This is part 3 of a 4-part online learning workshop for ACC faculty. Feel free to join us for as many sessions as you can, but recognize that this series is designed so that you don’t have to attend every session. Session three focuses on chapter 7, covering Motivating. Learning is challenging, so students must be motivated to engage in the work needed to improve their understanding. Discover the way emotions give students the motivation to succeed in your courses. Sign up for whichever time below works best for you. The same content will be covered on both of the April dates. Select one of the following times and register by clicking the link below. This is part 4 of a 4-part online learning workshop for ACC faculty. Feel free to join us for as many sessions as you can, but recognize that this series is designed so that you don’t have to attend every session. Session four focuses on chapter 8 & 9, covering Growing and Expanding. This session will cover two chapters. The first explores research on the growth mindset and how you can harness it to help your students. The final chapter of this wonderful book is a challenge to faculty to think about other ways they can grow as educators. We’ll share resources for moving beyond this book as you continue to explore the art of teaching. Sign up for whichever time below works best for you. The same content will be covered on both of the May dates. Select one of the following times and register by clicking the link below. "The suggestions for implementation from my colleagues was brilliant." "I learned about some new teaching techniques that I'd like to try in my class." "I loved this session! I did not attend the first one, but now wish I had done so..."
"...I was prepared for 1 1/2 hours of lecture (boring), but the session was fast paced and interactive."